1100 Florence Gallery exhibits artist Victoria Loeb this May. Join us for an opening reception May 4, 6-8p, as part of First Saturday Evanston Art Events. A distinct period or stage in a series of events, or a process of change or development. For the image you’re using on the postcards, I used acrylic and oil on canvas. Artist Bio: Victoria Loeb was born in 1980 in Buenos Aires, Argentina. In 1992 she met Argentine Artist Alicia Maffei and began studying with her. In 1996 she became her Drawing Assistant and worked with her through 1999. During that time, she was accepted at the Fine Arts InstitutePrilidiano Pueyrredon, where she studied until 2002. She also studied under Argentine Artist Miguel Ángel Bengochea, and later attended the studio of contemporary Artist Eduardo Medici. She moved to Chicago in 2003. After being represented by several galleries in the Chicago area, she moved her Studio to downtown Evanston and has worked on her Art since. Hosting sites, please email info[at]evanstonmade.org to be listed and promoted. April 6, 5-8p, join us for the opening of Kathy Halper’s solo exhibit "What a Day it's Been" at 1100 Florence in Evanston. Halper will be showing work created over the past two years, as well as some embroidered pieces. Listen to Kathy’s Interview on The Lisa D Show podcast, click here. A series of six paintings explore the angst and absurdity of our political climate. Embracing Russia's recent influence in our lives, I used the culture's beautiful folk art for my inspiration in creating these narratives. Other new works use discarded Amazon boxes as my primary material. Painting, gluing, printmaking and carving work together to create unique stories of my life. The show runs thru April 22. Artist talk Sunday, April 14, 3-5 pm. Don Miner resides in Skokie but is from Evanston. He is writing a book. Very slowly, but it will get done. He works in a school serving troubled youth, not just because he loves these kids but also for the ease of access to copy machines in the event he can’t get a publisher. Jayme Gualtier is a heavily tattooed, scooter-riding, music-loving, world-traveling, reclusive introvert who is fascinated by people and their stories. Her art is an ever-evolving conversation about the masks we all wear and what lies beneath them. Leah Lemelin explores presence, awareness, and fragile human perception within the Transparency Collection, a growing body of artwork on transparent, breakable surfaces. The work is a layerable catalog of ephemeral connection and an offering of gratitude and reflection. It plays in this way of ‘seeing’ for all who engage with it. Marjory Oliva has been making things her entire life, but it wasn’t until recently that she called herself an artist and built a studio in her basement. Marjory’s current work is acrylic and mixed media on canvas, though she is easily distracted by textiles, wood, and sparkly things. Marjory is fascinated by the power of color. Her favorite painting tools are credit cards and kitchen spatulas. Matthew Huang Cummins is an engineer/artist/educator on a mission to expand curiosity and community through the wonders of geometry. He is artist-in-residence at the Museum of Science and Industry, Chicago and teaches in the Segal Design Institute at Northwestern. Peter Durand is a globetrotting visual artist who lives in Evanston. Born in Kenya and raised in Tennessee, he studied visual communications, painting, and printmaking in St. Louis, Paris, and Kraków, Poland. He will happily bounce on a trampoline when the opportunity presents itself. Sarah Jolly is a part-time poet and a full-time student beginning to realize a body of written work in the space between past, present, and perfect. Saturday, March 2: Celebrate and elevate the visual arts in Evanston, attend First Saturday Art Events 12-8p. Inner Balance, Exhibition featuring artwork by: Helen Butler, Janise Curry, Lauren Herrmann, Lindsey Lugsch-Tehle, & Nancy Wong. Open Studio Project, 903 Sherman Ave, 4-7p. Meet Kristin and learn about her process Saturday, Feb. 2, 5-7p, during First Saturday Evanston Art Events. Two Sides to the Horizon - Is an extended wall installation to reflect the viewpoints from inside and outside the corner space of 1100 Florence. Merging these viewpoints over the four week period of the residency, this installation will evolve, merging multiple vantages into the visible sphere of the gallery space. Below is a schedule where the public is invited to come into the gallery space to see Kristin’s works in process. Thursday 2/21 1:00 p.m. -4:00 p.m.
Bio: Kristin Mariani is a Chicago based dressmaker, designer, artist, and educator. In her art and design practice she investigates hidden layers of labor discovered inside found cloth and garments, incorpo- rating physical responses to material that emphasize process, chance, and patience. In 2000 she founded her label RedShift; a line of contemporary couture created from salvaged materials and found garments. Her designs have been distributed internationally. She is faculty at The School of the Art Institute of Chicago, and an artist member of The Arts Club, Chicago. She maintains an in- terdisciplinary practice creating works for dance, performance, and installation. My practice is an ongoing discourse between design and art. I acknowledge the unstable distinctions between the two disciplines, and my investigations unfold in this unstable territory, continually questioning how the body is figured through fashion, place, and labor. Dressmakers are often confined to small spaces, small motor skills, mechanical cycles and repetitive processes. Handiwork is concealed in the inner linings of a garment. I don’t always want to stay inside of a dress. How can I use my skill set to address other spaces that the body occupies? How can I build coherent relationships from disparate parts? How can I connect the flow of raw material in my studio to a larger material stream and thought process? My raw material is a by-product of my dressmaking process and comes in parts. Thread is my drawing tool and connective device to reintegrate cloth fragments and garment remnants into coherent visual relationships. Stitching on two-dimensional surfaces enables me to create fronts that reveal what is commonly concealed in the facades of fashion. Structuring a crosshatch of materials to establish a new value for what is typically discarded, I deploy aesthetic strategies and skill- based knowledge to probe the historical, material, and labor-oriented underpinnings encapsulated in any effort to clothe the body. 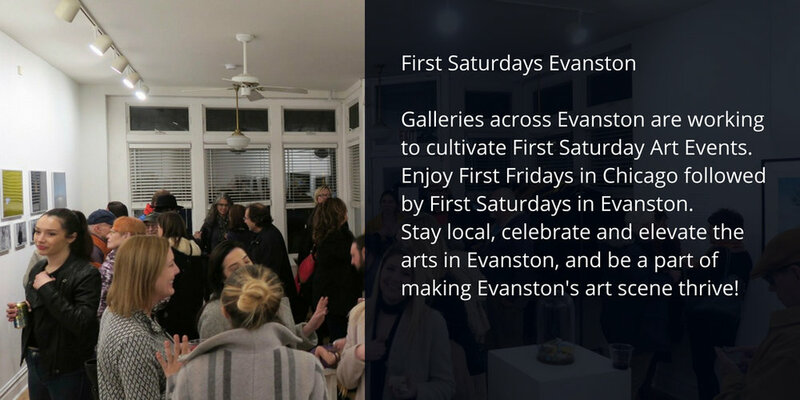 Celebrate and elevate the arts in Evanston by attending First Saturday Evanston events. Description: a video performance using the new Range Mobile Lab. The Range Mobile Lab, a converted a 1995 GMC step van, captures images from the surrounding environment which are mixed with preexisting video and projected onto screens mounted in the side windows of the truck. Sitting in the passenger seat of the truck, Rappaport “remixes” the environment in real time, performing a moving intervention into architectural space. https://twitter.com/rangemobilelab for links to social media and YouTube live stream. Clothing plays a relevant roll in human history. It can suppose a social status, a quest of identity, an aesthetic or protective function, etc. Clothing can affect the judgments of how others see you and can influence people’s insertion in society. In This show we are in, I display the act of getting dressed in a continuous group of repetitive images within indoor settings. This body of work also alludes to an interruption of a subtle intimacy through the relation between the viewer and the depiction of women, in the middle of the everyday ritual of dressing up. This intimacy interruption relates, at the same time, with the common and yearned process by the artist of exhibiting his/her works of art, which usually have been created in seclusion. Daniela Kovačić Muzio is a figurative painter born and raised in the Chilean Patagonia and is currently working in Chicago. Her work explores different topics around self-identity, largely through the depiction of women and children. Her work has been exhibited and published internationally. She has a master's degree from the New York Academy of Art and a bachelor's degree from Universidad Finis Terrae, Santiago, Chile. Daniela has received prestigious awards and scholarships such as Fulbright, Becas Chile, Robert Gamblin Painting Award, NYAA scholarships and residencies. In this personal workshop with letterpress artist Ben Blount, students will learn to create a hand-bound book as a vehicle for sharing stories, art, interests and ideas. Attendees will be introduced to the basic skills, tools and vocabulary needed to create simple book structures. This workshop will focus on the Japanese stab binding as the book structure to house our ideas. Students should come with artwork, clippings, sketches, notes, etc. that they may want to include in their books. Students of all levels welcome. All materials included. Florence Avenue has often been referred to as “Artist’s Row” in the burgeoning arts district of West Evanston. Join Art Encounter’s YOUTME to meet the artists and visit the studios and shows at Alder George, Collage Café, and 1100 Florence on exhibition this June during Evanston Made. Yummy bevvies and snacks will be served from spot to spot, get to know the artists and their processes. Art Encounter will share starting location upon registration. $25, all proceeds support Art Encounter outreach programs. To sign up, click here! 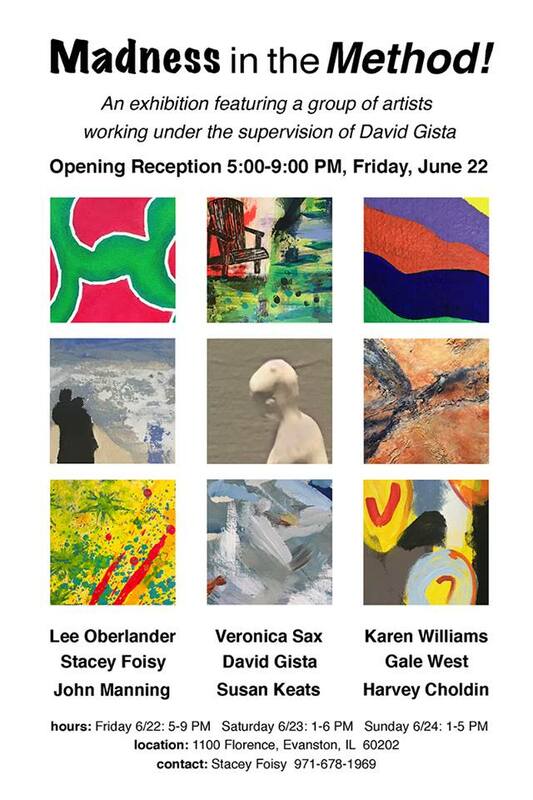 Opening party Friday, June 22, 5-9p, work on exhibit by Lee Oberlander, Stacey Foisy, John Manning, Veronica Sax, David Gista, Susan Keats, Karen Williams, Gale West and Harvey Choldin.